Hope you guys have been enjoying my beauty posts because I have another one here for you today! Today I am reviewing for you the Zudoya Rose Quartz Facial Roller that I have been trying out in my night time routine over the past two weeks, I hope you guys enjoy! Link to the Zudoya Home Page here. The roller comes beautifully packaged in a little luxurious white box with satin fabric on the inside. The roller itself feels quite heavy too! I do have another facial roller that I purchased myself awhile ago, but it feels nowhere near as heavy and luxurious as this roller! I'm also obsessed with rose quartz and I found this roller to be very visually appealing. I use the beauty roller once a day, usually in my night time routine. When using the roller, I roll gently on my face in an upwards and outwards motion to encourage lymphatic drainage and counter-act the effects of gravity on my skin. I use the large end on my cheeks, chin and forehead and the smaller end under my eyes and over the bridge of my nose. I will also occasionally use the large end to roll on my neck in an upwards motion. Another great way I've used my roller a few times is by placing it in it's special plastic bag and putting it in the fridge for an hour so that is super cooling and soothing on my skin. I've been incorporating the beauty roller into my nighttime routine two different ways. I've been using it either after applying my facial serum or after applying my facial oil. I love applying it after serum as I feel it helps to blend and press the serum into my skin so that my skin absorbs my serum more quickly. The other way I've been using the roller is after applying my night time moisturiser and facial oil to give my face a nice gentle massage. I find this technique is great for the end of a long day when you need a little stress relief. By using it this way I am also able to roll on my face for longer, as the oil takes much longer to absorb than a serum and this is at the end of my night time routine (my only other step is to apply a lip balm or lip mask). Both ways I find useful, and I like to mix it up between these two routines nightly. Some of my favourite serums to use with the beauty roller include Glossier Super Pure, Clinique Anti-Blemish Solutions Serum and the Youth to The People Hyaluronic Acid & Vitamin C serum. 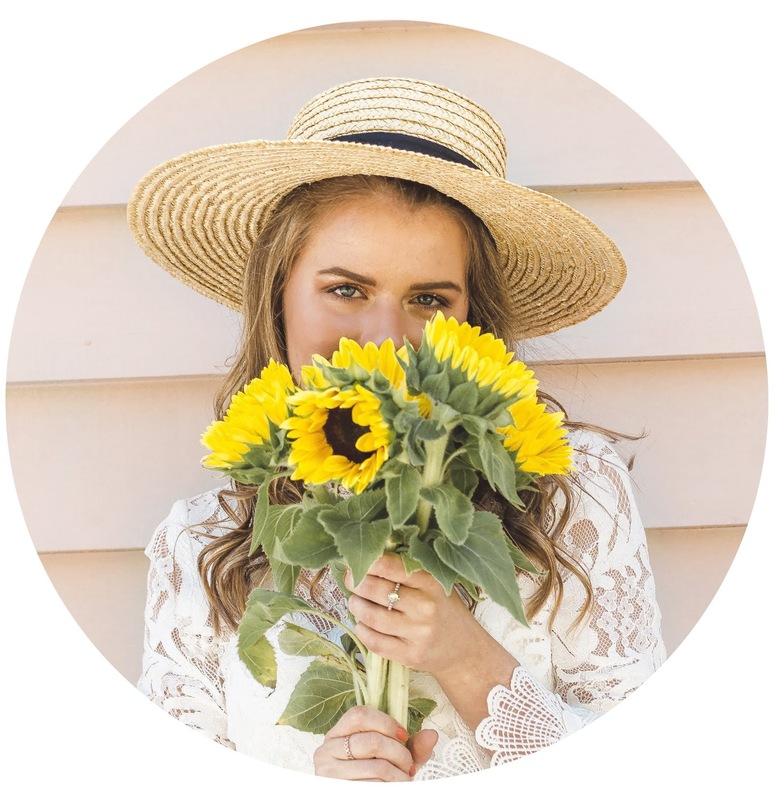 Some of my favourite oils to roll into my skin include Drunk Elephant Marula Oil, Salt and Hendrix Mermaid Oil and Herbivore Phoenix oil. 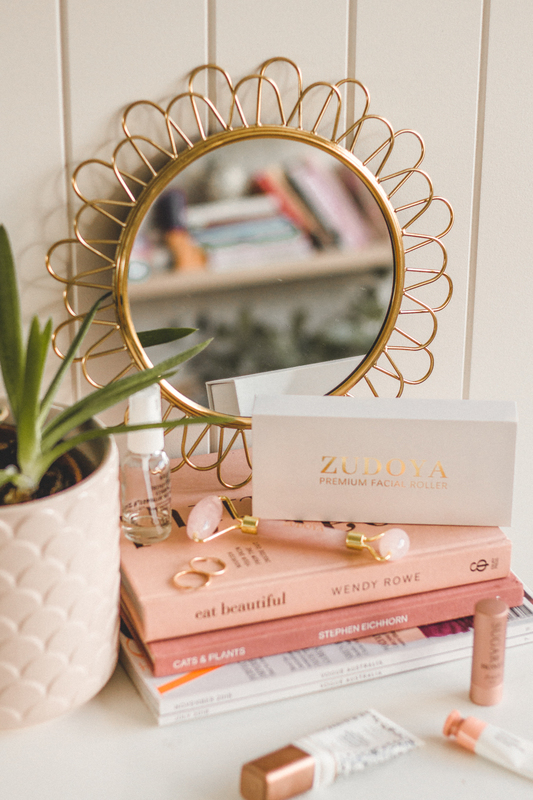 One main benefit I've found while using the Zudoya Rose Quartz Beauty Roller is that my skin appears more toned, and the puffiness, particularly under my eyes has noticeably reduced. Every morning I also notice that I have less oil residue on my skin and my skin appears to be brighter and more moisturised. Going beyond the skin, I also find that the daily massage to my facial muscles is amazing for helping to relieve tension in my face. I instantly begin to feel relieved of stress as my face begins to be soothed and massaged by the roller. I'm so glad I've been able to add this little procedure into my nightly routine! 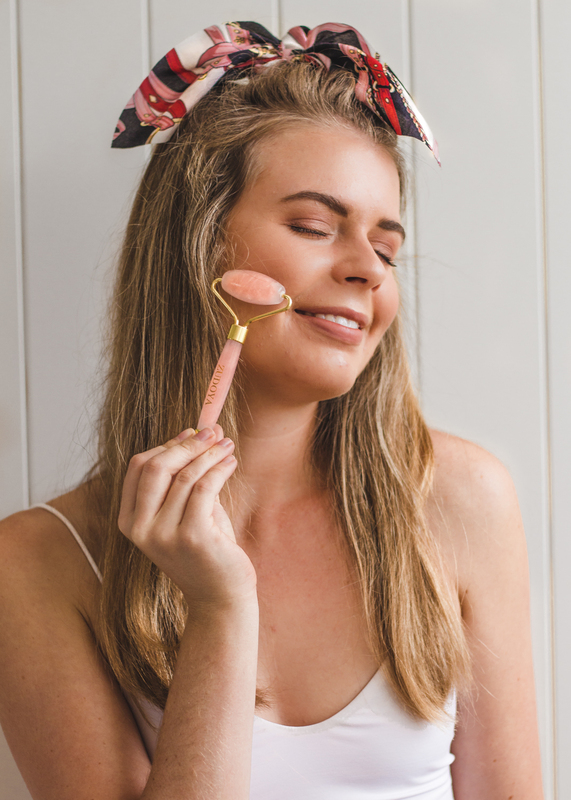 If you couldn't already tell, I am completely obsessed with the Zudoya Rose Quartz Beauty Roller and love how it is both great for my skin and great for switching off and releasing tension at the end of a long busy day. I highly recommend adding this step into your daily beauty routine! And if you'd like to check out the beauty facial rollers from Zudoya, simply click here! Do you use a beauty roller? If so, I'd love to hear your experience with a beauty roller and how you incorporate into your routine in the comments below!